Are you nervous about going to a college fair? You want to make a good impression, but you also need to learn key information about each school. The good news is that the schools want to make a good impression as well. Don’t be intimidated – be prepared! Here’s what you can do before, during, and after the college fair to get the most out of your time. Some prospective students don’t think at all about the impression they will make at the fair. That’s a big mistake! You don’t get two chances to make a first impression. Make sure that your dress, demeanor, and approach all display you as an ideal student for each school. On the other hand, don’t stress yourself out about being perfect. You aren’t being fully evaluated based on a single interaction. Also, don’t focus so much on impressing the representative that you don’t find out what you need to know about the college. Write Down Questions. What do you want to know about a school before you consider attending? In the heat of the moment, with dozens of people around, it’s easy to forget what you meant to ask. Write down your questions to make sure they get answered. Clean Up Your Email Address. Students often use their email address to express their personality. There’s nothing wrong with that, as long you have a separate more professional one for college admissions. Consider just using your name! Plan Your Outfit. While this isn’t an interview, you do want to look professional and put together. Consider going business casual – slacks and a nice top – to make a great first impression. Make Stickers With Your Information. Every college table you stop at will want to know your name, email, and address. Make it easy on yourself and preprint stickers with all your contact information, plus the name of your high school. Then, instead of getting writer’s cramp from filling out too many forms, just pull off a sticker and place it on the form. You’ll also be assured someone won’t misread your handwriting. 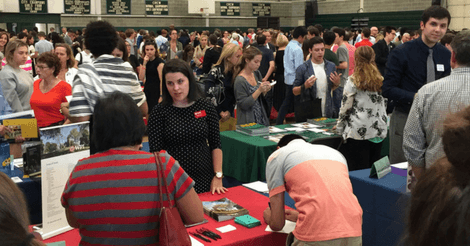 A college fair can be incredibly crowded, and it can be hard to keep your mind on your goals. Take a few minutes any time you need to during the fair. Step into a quieter area, take a deep breath, and re-center. Here are some tips to keep you on track during the event! Smile! If you’re nervous or overwhelmed, it shows on your face. Before you approach a booth, take a deep breath, smile, and walk forward with confidence. Ask Questions. You may not have time to ask everything you’d like to know, but hit your top concerns. You are one of many prospective students, so be polite and be aware that others may be waiting. Keep in mind that the people manning the tables at College Fairs may not necessarily be Admissions Officers, so you can save some of your more specific questions for them when and if you take a college tour. Take Notes! Even if you think you certainly won’t forget what people say, after the event the conversations may blur together in your mind. Be sure to write down the key points of the answers you receive, so you can remember correctly who said what. Get Printed Info Too. Be sure to grab a business card from the representative, along with printed brochures and flyers. This will help you remember which schools you visited with and keep names top of mind. After the rush of the actual event, it’s time to sit down with the information you gathered and start to make some decisions. You may have a feel for what schools are a good fit, and the notes you took will help as well. It’s time to review your notes and consider your feelings about each school, so that you can move them into categories. You can have an “Apply,” “Maybe,” and “Don’t Apply” pile. Store Information. It’s important to stay organized during this important decision-making process. Create either physical or computer folders to store information from each school you’re interested in. Put your notes, flyers, representative business cards, and more in each one. Do More Research. For schools in your “Yes” or “Maybe” categories, do more research. Discover whether they match your needs financially, academically, and socially. Put your additional notes in the appropriate school’s folder. Send a Thank You! If you know for sure that you’re excited about a particular college, consider sending a thank you to the representative you spoke with. Use the business card to stay in touch with them, and express your continuing interest in being a student there. A college fair is only one way to learn about a school. Take advantage of opportunities to speak to current and former students, visit the campus, learn more about college majors, and more. And don’t forget the benefits of visiting a college website. NACAC (National Association For College Admissions Counseling) holds 35 college fairs each year, all over the country. Some of the largest college fairs are held in major cities like New York City, Boston, Los Angeles, and San Francisco, but check their listing to find the college fair closest to you. Don’t feel pressured to choose a school simply because a lot of folks you know are planning to apply. You need to make the decision that is right for you and your family. Many students thrive at smaller schools, for instance, who may get lost in the crowd of a major university. Everyone is different, and the only right answer is the one that works for you. Learn all you can, and enjoy – college is a great time in your life! If you’re intending on visiting some colleges in person, make sure to plan in advance so that you get the most out of those visits.